Holidays in the Maldives are the ultimate in romance. The chain of Indian Ocean Islands are postcard-perfect, think all sparkling white beaches with crystal clear waters. There is some of the world's best luxury accommodation, making it an obvious choice for honeymoons or simply a romantic holiday together. Relax in a hammock in the summer sunshine or sunbathe all day in the 30 degree average temperatures. Book into an over-water villa or enjoy fine-dining with an exceptional range of local and international cuisine. For the best value all inclusive Maldives holidays call Purple Travel and save up to 60% on flights, hotels and transfers. Home to one of the two cities in the Maldives, this atoll is bustling with life. Consisting of 23 separate islands connected with causeways, this resort is perfect for those looking to explore the fantastic nature of the Maldives. Hike or bike around the area and give your Maldives holidays a feeling of adventure or visit the smaller islands and villages and learn all about the life of the locals. Diving couldn’t be more interesting as beside the usual stunning coral reefs and colourful variety of fish inhabiting the waters, you can see sunken warships and planes adorning the underwater landscape. This once off limits atoll is considered as one of the pearls of the Maldives. Home to crystal clear waters and fine white sand beaches, this complex of small islands is an idyllic location, home to a small resort aimed at those looking for the ultimate tropical relaxation. Laze by the beach while forgetting about the outside world or dive and discover the underwater life that calls this place home. After all, having holidays in the Maldives is what you choose to make of it and this definitely is a perfect location for whatever you may have in mind, from relaxing, to embarking on a tropical adventure. The untouched, Baa atoll is definitely the place to visit if you want to discover the wildlife around the islands. Diving and snorkeling are the main attractions here as the multitude of species of exotic fish and corals make up for a colourful underwater spectacle. Rent a bungalow situated over the picture perfect clear blue waters and dive in whenever you fancy. Having holidays in the Maldives is certainly something to remember for a lifetime and even more so if you choose to stay on this pristine and secluded atoll. Home to the capital of the Maldives, Malé, the Kaafu Atoll is the place to combine everything you might want for your holidays in the Maldives. Home to a bustling city, airport and vibrant resorts, this atoll is perfect for those looking for all inclusive cheap holidays to Maldives, as the multitude of hotels on offer can satisfy all budgets, while managing to maintain high quality. The museums and parks available on the island of Malé are distinctive of the Maldives and a visit is highly recommended. The biggest selling point of holidays to the Maldives, its stunning natural sceneries, is something that has to be witnessed in all its splendor at least once in a lifetime. Home to endless ocean views, fine white sand beaches and palm trees swaying in the gentle breeze, this island nation is as close to paradise on earth as someone can get. Rich coral reefs and sea life adorn the stunning scenery, making diving and snorkeling two of the must do activities to persuade. The inland vegetation of coconut trees and palm trees is indeed spectacular in itself and the small uninhabited islands could be your own private paradise to enjoy for a day or more. Holidays in the Maldives might be known as a luxury reserved for honeymoon couples, however if you decide to visit with children, rest assured that everyone will have the time of their lives. Most resorts occupy an island each and being an archipelago full of small exotic islands, the landscape itself is a natural playground. The shallow waters and open surroundings are safe for children to play in while you relax by the beach or pool, enjoying your cocktails. If you fancy more of a historic tour, then the island of Malé is the place to visit as the Friday Mosque, Palace and National Museum are worthy of their own mention. Get lost in the markets and explore the city while taking a break from the exquisite beaches the islands have to offer. Being a massive tourist destination, most resorts cater for all tastes, from African to Indian to international and most cuisines in between. The most widely consumed food is skipjack tuna which is prepared in a variety of dishes. Try the delicious mas riha tuna curry or the rihaakuru tuna paste and savour the flavours the Maldivian cuisine is proud of. Try the local palm wine and freshly prepared tea to wash it all down. The local population does not consume alcohol especially on the island of Malé, however you can find anything you might want in the resorts and tourist restaurants. 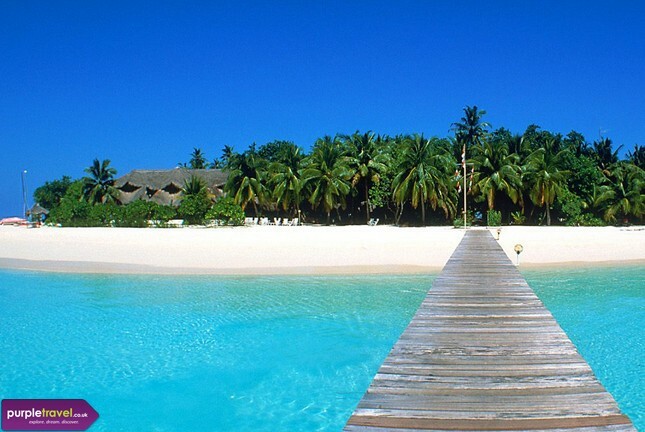 The weather is hot all year round and as such the Maldives are an all-year destination. With temperatures ranging from 27 to 29 degrees Celsius throughout the year, you are certain to find great weather to enjoy the endless beaches. September is the wettest month; however, this might be helpful if you are not particularly fond of high temperatures. Amongst the most important Maldivian holidays, Independence Day held on the 26th of July is a great occasion to be on the islands. The islands light up with colours and parades and the festive spirit is endorsed with performances, festivities and feasts, guaranteed to make your holidays in the Maldives even more memorable. An exciting event hosted on the 11th of November, the Republic Day commemorates the day the Maldives became an official republic in 1968. The festivities usually take place in Malé but the rest of the islands are not left out as each one hosts its own parades and celebrations contributing to an overall festive atmosphere. The biggest event throughout the year, the Eid Festival is definitely a great occasion to be on holidays to the Maldives. Upon the end of Ramadan in September, the locals celebrate for three consecutive days, hosting huge feasts throughout the islands and showcasing the cultural and religious wealth of their nation. It was great, lovely weather, great staff in the hotel. I would definitely go back. This place is seriously amazing, I couldn't believe the beaches, they were perfect. One of the best holidays I've ever had, was snorkelling and relaxing. It was fantastic. Beautiful beaches, nice pools, kiddie pool perfect for my daughter. Very relaxing holiday.